“I’m gonna miss this when it’s over.” TNT has released several new promos for the seventh and final season of Rizzoli & Isles. 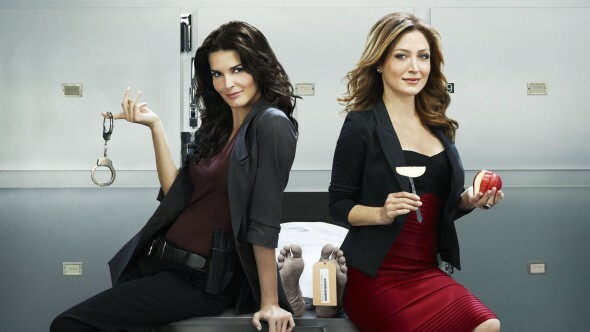 The procedural drama, which stars Angie Harmon and Sasha Alexander, was cancelled back in January. The final season begins on June 6th at 9 p.m. ET/PT. What do you think? Do you watch Rizzoli & Isles? What do you hope happens during the last season? I am so sorry to see Rizzoli & Isles go. I watch this show with my family, it’s one of the great shows that is still on. I don’t understand why all the networks are cancelling these great shows and leaving these horrible reality shows on. Please please don’t cancel this show. Great acting, exciting drama with some humor. Sorry to see it go but again not surprised! This is the one show my husband I watch together. Sorry to see it go.. will be watching reruns. My wife and I have watched Rizzoli & Isles since the first episode. The cast is well blended, scripts are well written, and we enjoy the flow of each episode. This was the only show we watched on TNT, so when Rizzoli and Isles is gone we will be out of here as well. I don’t understand why the Networks have to continually cancel great shows. I have really enjoyed Rizzoli & Isles. It really pisses me off! Love the show. Can’t believe this is the last season. Wish the cast all the best. If the show was anything like it was seasons 1-4, minus the boyfriends, I would really be sad, but season 5 was pretty lousy and season 6 was just awful, so I am kind of glad it is going away, the new show runner already has destroyed so much of it for me, I would prefer she have less of an opportunity to make me never want to watch again. say it isn’t so! This is one of the best (if not the best) shows on the air!